To concentrate on the basics creating a conducive atmosphere for learning * To design curriculum, covering a wide range of learning experiences stressing on writing, reading and listening skills * To provide an opportunity for personal development in a wide range of academic, cultural, social, literary, communicative, creative and recreational activities *To accommodate and encourage the students with different ability levels on the same platform and improve *To prepare courageous, self confident, self respecting, caring and sharing responsible citizens with good behaviour and discipline * To make socially responsible honest and concerned citizens *To encourage and provide opportunity to boostup leadership qualities to withstand any challenges in real life and compete regionally, nationally and globally with strong language base in regional, national and international levels *Thus our school shall lay a very strong foundation by the time the student completes secondary level. Imparting education with strong foundation in basics like vocabulary, pronunciation, terminology, usage of grammar and language in its proper form enabling the students capability to put of their ideas on paper perfectly on their own, along with participation in Robatics codinggames, sports, arts, craft, theatre, music, gardening, oration and mathematical skills at school level shall lay a strong foundtion on which any super structure can become long lasting. School is situated in a pleasant and delightful surroundings of Divyanagar with its picturesque playgrounds and gorgeous gardens with in an area of 3.5 Acres. It has a beautiful three storey building in two blocks offering individual classroom accommodation for about 2000 children. School caters for children from 3 to 15 years of age in two buildings of more than 50,000 sft. in the campus which are used for different age groups accommodating students of all economic groups. The school provides a friendly, welcoming atmosphere and encourages development of the children grooming them into all-rounders and active members of the society. School is proud of its achievement in nurturing each child to their full potential within the short time of establishment. School is established in the year 2009 by Nalla Malla Reddy Education Society under the pioneering guidance of its Secretary Sri Nalla Malla Reddy with a motive to contribute his might to the society to give light in the present days of darkest era of schooling for our blooming children, whose future is put to uncertainty with falling standards except intuitive students by the time they pass out from the school. The school being a launching pad for a students brilliant future the FOUNDATION SCHOOL is started to create a strong basis at school level itself, where they excel in behaviour, discipline, hardwork, writing, reading, understanding, creativity and also written language which is the channel of communication. Normally, we try to group children in classes according to their age, but this depends on members admitted each academic year. Every year we reorganize the classes to enable pupils to get to know their year group, to enable us to balance the number of boys and girls and to balance the level of abilities of pupils within each class. Different teaching methods and types of organization are used within the school like class lessons, group work and individual teaching..
* Fully fenced secure grounds * Laboratories for Physics, Chemistry, Biology, Computers and separate rooms for Activity, Art, Craft, Music, Dance, Debates and Cookery * Play grounds, an indoor and an open air meeting place, and a separate ground for drill * Medical room and Multimedia rooms are provided separately * Library with rich collection of books from all over the world in three languages of English, Hindi, Telugu and Magazines and Newspapers * Spacious Class rooms * For LKG to Class 3 class individual student tables are fitted with slates to practice writing and scribbling with chalk piece for better writing. The school provides the students with the best faculty and infrastructure facilitating towards proper foundation at school. . The students could stand on the top in various international and national competitions including olympiads. 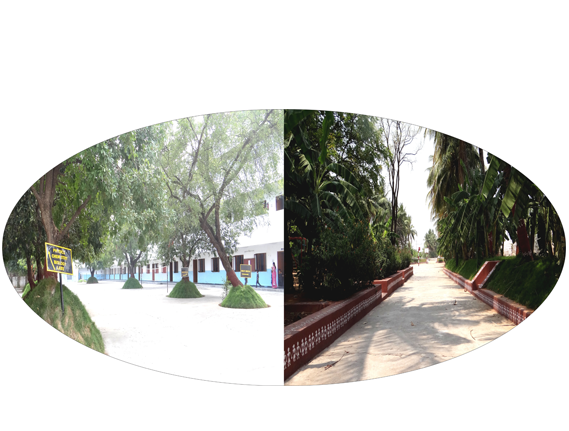 Every day students exercise in the lush green surroundings making them energetic active to concentrate on studies. Various study tours are conducted based on the subjects in classes and to understand the real side of the society. NCC in school is a regular activity imbibing the students with the spirit of unity and discipline.. The students are encouraged to build up their leadership skills and get acquainted with public speaking through the assemblies held regularly. Students attend regular sports events at school level, state level, national level and international level. Hands on approach to introduce scientific enquiry and creative engineering design with the basics of coding and robotics is given through the STEM program. The students are specially encouraged to participate in story writing, poetry, debates, dance, drama, sports, music, robotics and art. Education at school is nothing but preparing the student to be able to put on paper whatever is learnt, seen, heard, observed and thought about all around them in the world, with proper language in a communicative format, with attractive presentation molding into the basis for scholarly persuasion in all fields of knowledge in life. .
Imparting Education with strong foundation in basics like vocabulary, pronunciation, terminology, usage of grammar and language in its proper form enabling the students capability to put of their ideas on paper perfectly on their own, along with participation in games, sports, arts, craft, theatre, music, gardening, oration and mathematical skills at school level shall lay a strong foundtion on which any super structure can become long lasting.